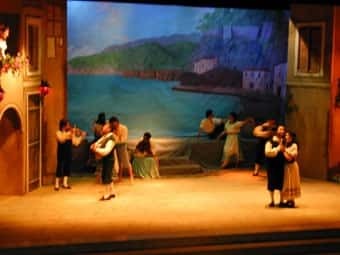 On the stage of Tasso Theatre, the tradition of two centuries of napolitan dances, customs and music becomes an impressive musical. Magic songs such as "Torna a Surriento" flascinate spectators and carry them back to the past trhrough a faithful scenery from an historical point of view. The show which lasts 75 minutes, tell about the daily life of southern people through four scenes. The first scene represents the sea. The view shows the Gulf from Marina Grande to Scutolo: fishermen get ready for their daily job and thanks to songs, (Piscatore e Pusillepo, Mandolinata a Napoli, O' Marenariello, Michelemma, etc) their hard labour becomes a pleasant moment. The market has got its own music made of rumours and stories. 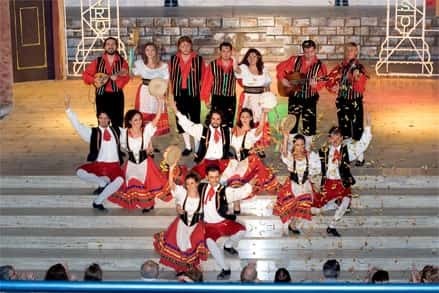 In the sqyare, peolple fall in love or get jealous while shopping: in the meantime courtships and wuarrels are mixed with the rhythm and the steps of Tarantella. 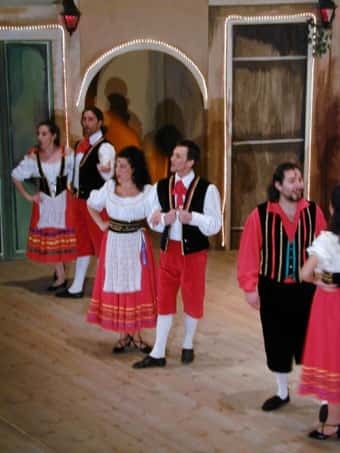 The following songs frame the scene: O' Sole mio, U paese do sole, Santa Lucia, Te voglio bene assaie and Carme. At sunset and with the Vesivius on the horizon, love seems to be the best passion to be sung. The landascapes which attracted and inspired the famous writers of Grand Tour (from Goethe to Wagner, from Nietzsche to Croce) express their eternal charm trough the song that were written in these places... Marechiaro, Torna a Surriento, O' surdato nnammurato, O' sapore de cerase. The musical ands with a festival atmosphere. The square is illuminated, the sky is crossed by fireworks, everybody is captivated by the rhythm of dance (Tarantela Rossini) and communicates his hoy of life (Popolo Po, Comme facette mammeta, Dduie paravis and Funiculì Funiculà) even though everyone is ready to face the following day with its passions and its responsabilities.